I caught up with Josie and the University of Houston undergraduates who serve as Editor (Kim Coy) and Co-Managing Editors (Anthony Álvares and Amanda Ortiz) to learn about Glass Mountain. CHARLOTTE WYATT: What made you decide to join the magazine’s staff? JOSIE MITCHELL: I had an early opportunity in my MFA degree to teach a creative writing class for undergraduates. The best part of that experience, hands down, was working with UH students. In fact, many of those students are involved in Glass Mountain now, including Kim Coy, the magazine’s editor. CHARLOTTE: How do you reconcile your separate roles as writers and editors? ANTHONY ÁLVARES: I’m a private person and it’s hard for me to share my writing with other people. As an editor, I feel that I am able to encourage not only writers, but anyone with an idea, to share their thoughts comfortably. 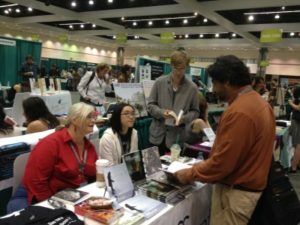 KIM COY: Just because I’m an editor for a literary magazine, that doesn’t automatically elevate my writing or sense of taste over the folks submitting to us. I try to remember that the same way I’m voting yes or no on an author’s writing, other editors are making those same decisions about my writing. 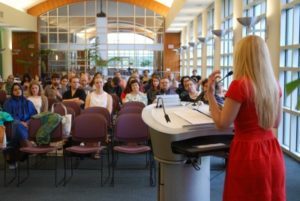 CHARLOTTE: How do you choose readers for your reading series? KIM: Generally, we look for one graduate student and one undergraduate student from UH, and one community writer. For issue launches, we ask local artists who were published in the forthcoming volume to read their piece or talk about their art to give those attending a peek into their process. AMANDA: I know I’m usually trying to book readers who will be fun and engaging for the kind of crowd we tend to pull in when we host at Bohemeo’s. JOSIE: I gotta say, these last few readings have been so much fun. Our last reading was on Game 6 of the World Series, which Bohemeo’s played inside. We had more people at our reading outside than there were watching the World Series inside. I mean, come on! CHARLOTTE: What should writers know before they submit their work to you? ANTHONY: This year we are all super excited about Shards, our online magazine. We are planning on launching a new issue every two months. […] I would like to see more contemporary reviews, as well as interviews and essays. KIM: When reading prose, I look for strong language, whether it’s diction that helps establish character or unusual similes and metaphors. I also like to be surprised, but less in an O. Henry way and more in a Flannery O’Connor way! CHARLOTTE: What should folks know about the launch tomorrow? ANTHONY: When you see our magazine at the launch this Tuesday, you’re going to see a totally new format. I love the look of our latest issue, but folks should know that while our exterior is constantly evolving, what’s inside continues to be awesome work from some of the best emerging writers we can find. JOSIE: There will be pizza! And the fiction winner of the Robertson Prize from the Boldface writing competition, Victoria Hodge Lightman, will be reading her winning submission.